Estudios previos indican que las moléculas inflamatorias tienen un papel importante en la fisiopatología del trastorno bipolar (TB). La evidencia apunta a que el TB puede presentar un curso progresivo. Por lo tanto, existen teorías que han postulado una relación entre la progresión y los estadios de la enfermedad con diferentes biomarcadores Revisión sistemática periféricos. El objetivo de este estudio es realizar una revisión sistemática de la literatura de los estudios sobre la asociación entre los marcadores inflamatorios periféricos y las variables clínicas relacionadas con la estadificación en los pacientes con TB. Se llevó a cabo una revisión sistemática usando las bases de datos electrónicas PubMed, SciELO, LiLACS y PsycINFO. Las palabras clave se dividieron en marcadores inflamatorios y TB y estadificación. Se incluyeron estudios que evaluaron a pacientes con TB en fase de eutimia, estudios que evaluaron biomarcadores periféricos y estudios que correlacionaron dichos marcadores con las variables clínicas relacionadas con la neuroprogresión o estadificación del TB. Se presentan y se discuten los métodos y los hallazgos de 10 artículos. Los marcadores inflamatorios se determinaron con diferentes técnicas y mostraron resultados contradictorios. La super familia del factor de necrosis tumoral y las citocinas inflamatorias podrían tener una relación con la neuroprogresión de la enfermedad. El presente estudio indica que el factor de necrosis tumoral y las intereucinas pueden tener un papel en la neuroprogresión del TB. Sin embargo, se requieren estudios longitudinales con el fin de clarificar la relación entre los factores asociados con la neuro-progresión. The goal of this study was to carry out a systematic review of the literature for all available studies that evaluated the serum or plasma levels for inflammatory markers in patients with BD, and its association with stages or clinical variables related to the staging of the disease. A systematic review of the literature was carried out following the PRISMA23 statement up to June of 2015, and in the main scientific databases: PubMed, SciELO, LiLACS and PsycINFO. There were no restrictions on year of publication or country, and the keywords were divided into 2 domains: a) Inflammatory markers using the MESH terms inflammation, cytokines and interleukins tumor necrosis factor, and b) Bipolar Disorders and staging using the MeSH terms staging OR bipolar disorder. Initially repeated articles were eliminated and the selection was made based on title and abstract in order to verify that they met the inclusion and exclusion criteria. Then the complete articles were evaluated. A review was carried out on the references from the original articles, as well as on some of the revisions that were found, with the aim of identifying other publications that could have been lost. The systematic search and selection of the references was carried out by two researchers (MCR and KD) and was overseen by a third researcher (CV). The study population was 18 and over. The studies involved patients diagnosed with BD by a structured diagnostic interview based on criteria from the DSM or CID. The studies assessing circulating inflammatory markers with plasma or serum samples in vivo. The studies that used classification by stages or that included in the analysis clinical variables related to staging of BD: age of onset, the length of illness the number of episodes and cognitive functions. Studies evaluating genes related to inflammation and in vitro or morphological studies. After eliminating duplicate references, 186 articles remained, which were examined by title and abstract. Of these, 139 were excluded as they were posters, preclinical or genetic studies, or they measured the effects of medication. Finally, 47 articles remained for more exhaustive review. After review, 39 articles were eliminated given that they did not correlate inflammatory biomarkers with variables related to staging. Two additional articles were obtained through cross-referencing. After finishing the selection process, 10 original articles were included in the systematic review that met the inclusion criteria. Figure 1 shows the selection process (Figure 1). Figure 1 Flow diagram of selection process. The most frequently evaluated clinical variables related to BD-I staging were the age of onset, the length of illness and the number of episodes. Four studies evaluated cognitive functions24,27,29,30 using, respectively, the Frontal Assessment Battery (FAB),32 the Repeatable Battery Assessment Neuropsy-chological Status (RBAS),33 the cognitive evaluation described by Gildengers,34 the Wisconsin Card Sorting Test and the Rey Auditory Verbal Learning Test. One included history of psychosis25 and 2 studies created a staging model which divided the patients into two groups: early and late stages of the disease.18,19 The Kauer-Sant'Anna et al. study definition of stage take in account the length of the disease, and the Grande et al. study determined early and late stages based on the functional assessment, age of onset, length of illness and number of episodes. Table 1 shows the characteristics of the studies included (Table 1). Table 1 Features of the studies included in the systematic review. The TNF family was evaluated in 7 studies. These studies find no association between TNF and age of onset of BD. Regarding the duration of illness, the only study which found a relationship of the TNFα with this and the number of depressive and manic episodes was the study of Kauer-Sant'Anna.19 In this, the TNFα levels were higher in patients in both stages when compared with controls, and a greater elevation was described in the late stage when compared with those found in early stage (F = 12.1; d.f.=7,52; P=.001). The study of Barbosa et al. (2012) showed a positive correlation between TNFα plasma levels and the inhibitory control subtest of the FAB (p=.50; P=.02) and Doganavsargil-Baysal et al. (2013) showed a negative correlation with the RAVLT delayed recall (r=-.275; P=.04). The duration of illness showed positive correlation with the soluble Tumor Necrosis Factor Receptor-1 (sTNFR1) in 2 studies (P=.36; P=.01; r=.278; P=.0001)26,28 and with the sTNFR2 in 1 more studies (P=.42; P=.05; r=.32; P=.01).28,30 Furthermore, a positive correlation was found between the sTNFR1, both for the number of episodes (r=.428; P=.001)30 and for the length of hospitalization (P=.23; P=.04).25 The other studies found no relationship between sTNFR and the studied variables. The relationship between neurocognitive impairment and TNF family were contradictory. Table 2 shows the studies that included TNF superfamily and its correlation with clinical variables. 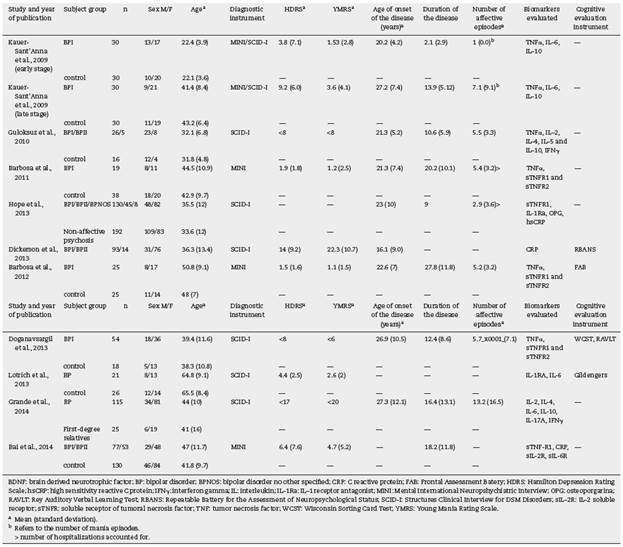 Table 2 Studies that included the TNF superfamily and its correlation with clinical variables. Interleukins (ILs) were evaluated in 6 studies, however not all measured the same families of ILs.18,19,25,27,31 The studies that investigated correlation between ILs and clinical variables can be found on Table 3. Table 3 Studies that included interleukins and their correlation with clinical variables. Hope et al.25 found a positive correlation between the IL-1 receptor antagonist (IL-1Ra) with a history of psychosis. In the study of Lotrich et al.,27 the IL-1Ra was inversely correlated with three cognitive function factors and global cognition (r=-.37; P=.01). The patients with high levels of IL-1Ra had worse performance in visual cognition, memory cognition, speed/executive cognition and global cognitive function. No relationship between age of onset, illness duration and number of episodes with IL-1 was found. Three studies evaluated the IL-2 family.18,26,31 Only Bai et al. 26 found a positive correlation between the soluble receptor of the IL-2 (sIL-2R) and the length of the disease (r=.133; P=.03). The results suggest that there is a relationship between the IL-1Ra and sIL-2R and specific symptoms of the disease: the IL-1Ra with the severity of cognitive function and the number of episodes, and the sIL-2R with the length of illness. Studies have found elevated levels of IL-1Ra and sIL-2R in mania episodes, but not in states of euthymia,22,37 which would indicate a relationship between the IL-1 and IL-2 system and the deterioration of specific symptoms, and express a state of chronic inflammation. Further cohort studies are required that analyze the levels of these markers in mania episodes and euthymia in early and late stages of the disease, so as to clarify whether or not they are related to the stage or to specific symptoms. OPG is a soluble member from the superfamily of receptors of the tumor necrosis factor, and has a central effect on the immune system.43 It is activated by proinflammatory cytokines and has been linked with the risk of suffering cardiovascular disease and diabetes.44,45 However, the Hope study found no association with the severity of BD-I, which may be explained by two factors: either by the anti-inflammatory effect of IL-1Ra, which was found to be elevated and could offset OPG activation, or because the prevalence of arterial hypertension and diabetes was only 5% in the study sample, which would indicate greater specificity of OPG for these diseases and lesser for BD. The results suggest that the levels of the IL-1, IL-2 and IL-6 families could play a key role in neuroprogression and may be potential markers for staging diagnosis and therapeutic targets for BD-I. Moreover there may be further sources of error that remain unmeasured. One such source could be the effect of the treatment on the inflammatory biomarker levels. These were only measured in one study, which suggests that lithium may have a confounding effect.31 Likewise, the levels of inflammatory biomarker could be affect for some diseases like obesity, hypertension and diabetes that the studies did not take in count. The most significant limitation of the review is that the results that relate biomarkers with variables involved in staging are the product of secondary analyses, except in 2 studies. For the Kauer-Sant'Anna and Grande studies, the main goal was to establish the relationship between inflammatory markers and TB I stages, but there was no homogeneity of criteria that split patients into stages. Although the selection criteria were homogenous, the samples were different in some clinical variables. The mean patient age, mean length of illness and mean number of episodes were different in the studies, which makes it difficult to generalize the results. The levels of cytokines can be affected by some conditions like the use of novel technologies, sampling, use of anticoagulants and storage.46 The sample collection protocols and biochemical assays in the studies were different, which may affect the comparisons between the results. Another limitation is the inclusion of studies with different analytical methods given the scarcity of workable studies, making the generalization of results difficult. Ten studies with original data, which compared inflammatory marker levels to variables related to staging, were chosen for this study. The most significant preliminary findings, although inconsistent across all studies, are that the TNF superfamily and inflammatory cytokines may have a relationship with the neuroprogression of the disease, and support the hypothesis that they may be considered stage markers based on the staging model of BD. These results strengthened the inflammatory theory of BD, and suggest that the relationships between the inflammatory factors and clinical features of neuroprogression are complex. Longitudinal studies are needed, with larger and multi-site samples and greater uniformity of criteria, which allow the research to establish causality, clarify the relationship between factors associated with neuroprogression, measure the effect of the treatment and facilitate the creation of stage diagnostic criteria for BD. Also, further investigations evaluating the relationship between inflammatory biomarkers and clinical variables related with early and late stages of bipolar disorders, genetic markers, imagenologic or neurocognitive variables should be performed. Conflicts of interest The authors have no conflicts of interest to declare. *Corresponding author. E-mail address: carloslopezjaramillo@gmail.com (C. López-Jaramillo).